Dr. Arlene creates distinctive brands to direct the trajectory of businesses, organizations, and individuals. 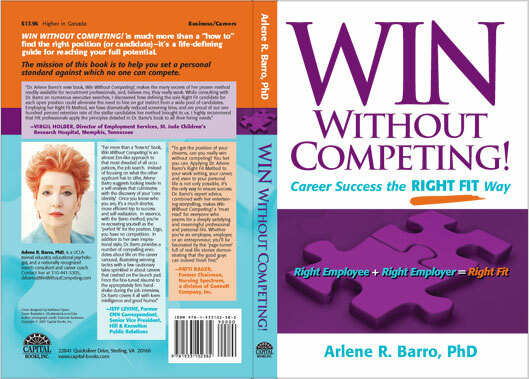 WIN Without Competing!, nominated for a Business Book Award, was published in the U.S. by Capital Books and published in India by Macmillan. Determine if a job is the Right Fit by matching the requirements of a job description to the blueprint. Convince the employer that you are the Right Fit, if that is in fact the case, by using a unique set of strategies. Stop the employer from interviewing lots of candidates because they have found the one Right Fit – You. Gradually negotiate with the employer your desired compensation before you are officially offered the job. Dr. Barro presents the Right Fit Method in an unusual style, using fascinating true-life stories of people she’s helped and real stories that people wrote her about their careers and personal lives. Perhaps your career success story will be in her next book! Dr. Barro is compassionate on one hand, but no-nonsense on the other. She builds your confidence by debunking outmoded notions and focusing your career search on you and what you have to offer to the right employer. Her refreshingly straightforward, step-by-step 'Right Fit Method' enables you to adopt new career strategies that will change your life. WIN Without Competing! is a lifetime companion that will guide you to your first big position and coach you through all the changes in your career. Join Dr. Arlene on Facebook, LinkedIn and Twitter.